Brown Leaves on Japanese Maple Trees - What's the Cause? You've had Japanese maple trees for a long time, with no problems. Suddenly, this summer, you are finding brown leaves on your specimen. You wonder why. Below you will find a closer look at the problem, including causes, symptoms, and some possible control solutions. Japanese maple trees are often understory trees in their native habitats. Over-exposure to sun can result in brown leaves, a phenomenon also known as "leaf scorch." A hot summer can leave even established specimens that are too exposed to sun with brown leaves, especially if other debilitating factors are present. Physical damage to the root system -- whether caused by pests, heavy traffic, or digging. Any of these factors can stress out the plant, making it susceptible to sun damage during a hot summer. In terms of symptoms, it really depends on the severity of the situation -- in other words, it is a matter of degree. The leaves will remain on their branches and just a few will brown up (typically in the upper branches) -- and only at the margins (edges) -- in the least severe cases. At the other end of the spectrum, the extent of the browning will be greater on each leaf, it will occur on all (or almost all) of the leaves, and the leaves will become brittle and eventually drop off. First of all, do not panic. It may strike fear into your heart when you see that your beloved specimen has shed its leaves after a hot, dry spell in the summer and now stands there naked, but do not take this as a sign that it is dead. Rather, it is only a defense mechanism. Fact is, your plant has secondary buds, which will produce a second set of leaves. That last thing you want to do, in your state of panic, is to reach for your fertilizer spray tank, as if it were a magic wand that cures all ills. Here's why it's not a good idea to fertilize trees in ill health. Situate them so as to afford them some shade (especially during the worst of the heat in the afternoon). Make sure to water them adequately during dry spells. A deep watering done less frequently is better than more frequent, shallow watering. Your goal is to have the soil evenly moist, not soggy (that is, do not overwater). Rather than trying to find a foolproof watering schedule (such a thing does not exist -- not across all climates, at least), get into the habit of checking your soil in between waterings to make sure it's not drying out. Follow directions carefully when you do use chemical fertilizers. Generally speaking, the proper time to fertilize Japanese maple trees is late winter or early spring (using a slow-release fertilizer). If you do not want to have to worry about being precise in your fertilizing regimen, simply use compost, which will never harm a plant and can be applied at any time. Spread mulch around the plant (but apply the mulch around your tree in the proper way) to help protect its root system. 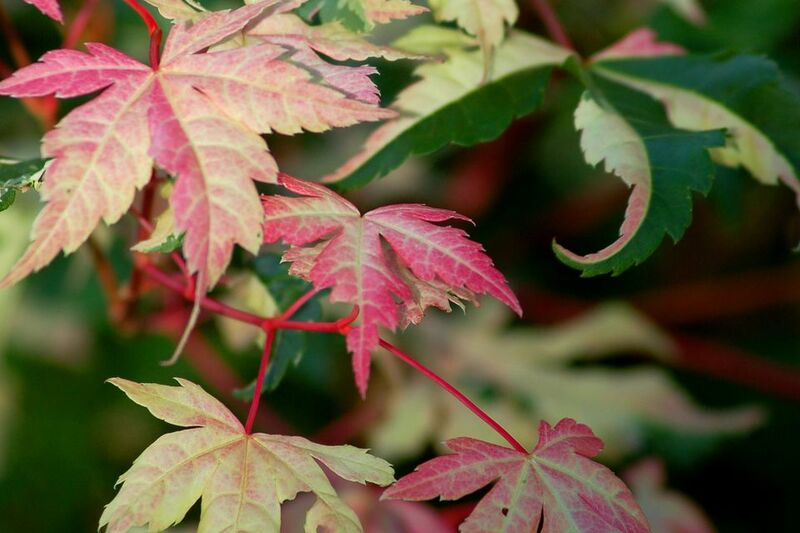 Select a sheltered spot when planting a Japanese maple tree, so that it will not be exposed to high winds. While it is a good idea to follow all of these control tips, be aware that doing so does not in any way guarantee that your plant will not experience browning on its leaves. I have adhered to all five of these recommendations with my own Harriet Waldman Japanese maple, yet it always suffers some leaf scorch during the course of the hot summer. If you find that, no matter how careful you are to do all the right things, your Japanese maple tree still gets brown leaves in the summer, consider experimenting with cultivars that are known to bring helpful qualities to the table. 'Crimson Queen' and 'Bloodgood' are generally considered relatively sun-tolerant, for example. How Does Topping a Tree Differ From Pollarding It?